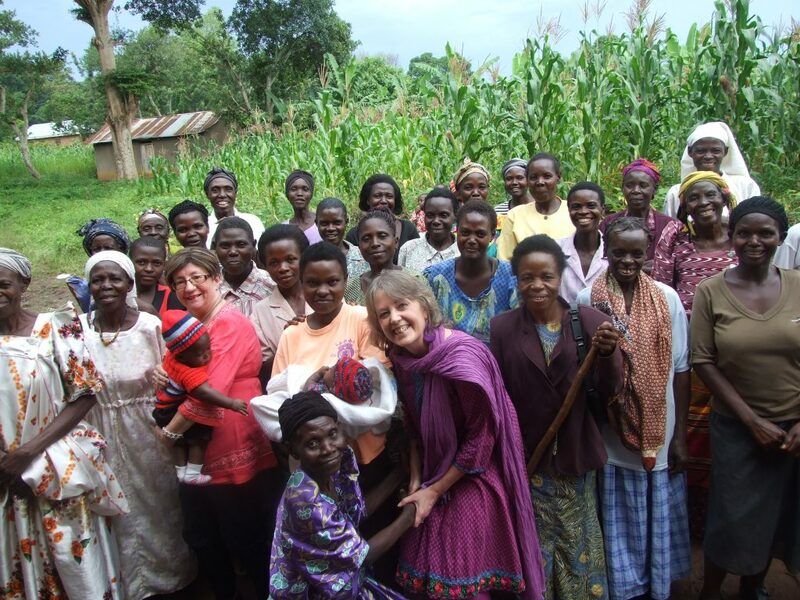 These are the words of Karen Davies, founder of Purple Shoots, who travelled to the Ugandan region of Mbale in May 2017 with PONT and 5 members of ‘self-reliant groups’ from South Wales. 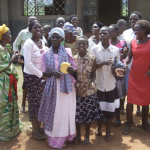 They went to learn how people in Ugandan villages have come together to boost their incomes and help their communities. 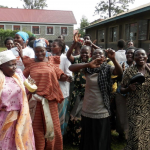 The trip was organised by PONT with funding from a Hub Cymru Africa grant as part of a wider project that set up 19 self help groups with over 500 people across Mbale region. 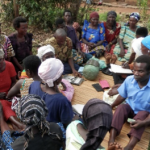 The groups meet every week to save small amounts of money and take part in training, and the most needy families in each community are also given a female goat to breed. Families take loans or sell goats to keep children in school, invest in small businesses, make homes safe and dry or grow more crops, or deal with emergencies – basic necessities. 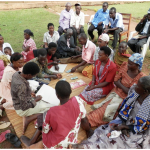 It’s an approach that has helped 1000s of Ugandan people over the past 10 years through the Livelihoods section of PONT, a charity which also runs health, education and environmental programmes. The model is all about training and investing in communities to empower people to help themselves – so joining up with Purple Shoots was a perfect partnership. Purple Shoots is a charity and microfinance provider that tackles unemployment and economic problems in some of the poorest areas of Wales. It provides ethical and fair loans and sets up self-reliant groups of between five and 10 people, who are from similar areas and backgrounds, and who want to make a difference in their lives. Purple Shoots helps them turn their ideas into small businesses to generate their own income, and boost their communities at the same time. 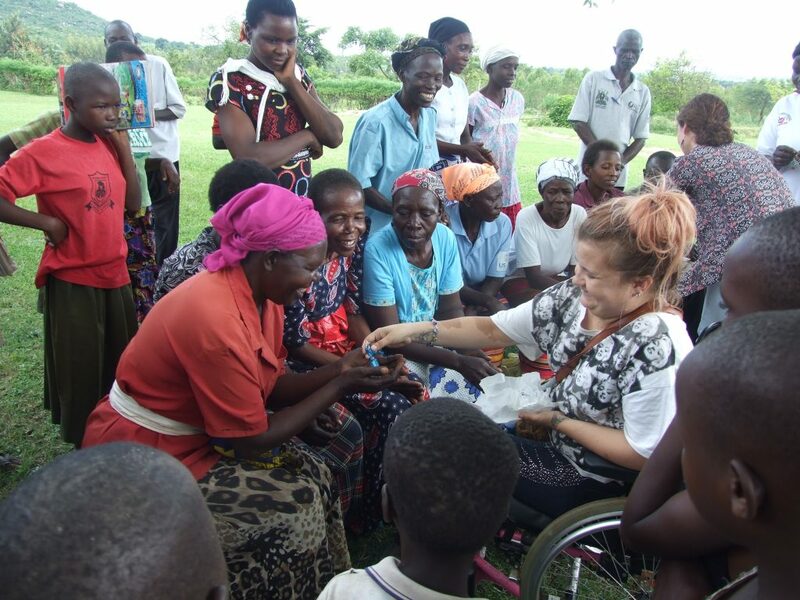 The group that travelled to Uganda included Drom Thomas, aged 42, from Treherbert. She is working with Purple Shoots founder Karen to start a new self-reliant group in Treherbert. 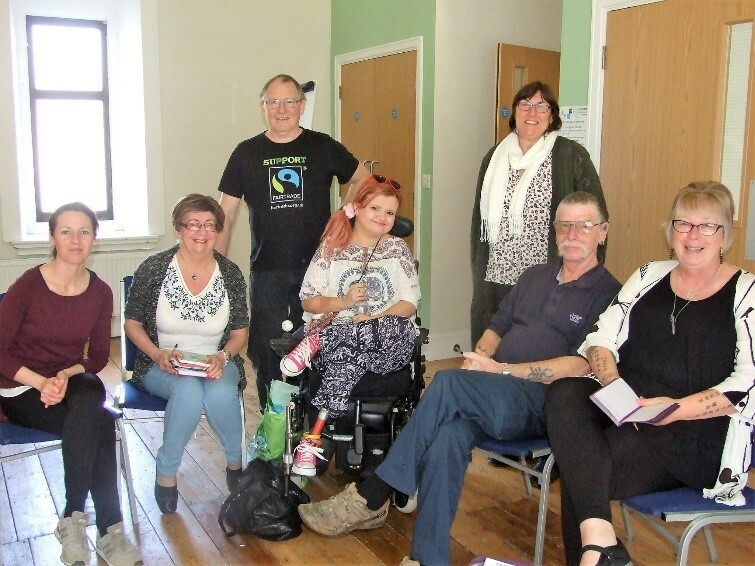 Richard French, aged 63, and his wife Chris, aged 58, attend a group in Ystrad, Rhondda, which supports isolated people in the community. They use crafts to develop skills and raise funds to fund their group. Rita Evans, aged 63, and her daughter Sarah Evans, aged 38, are from the Crafty Buddies group in Swansea. This group funds itself by making craft items together and sells them at craft fairs. 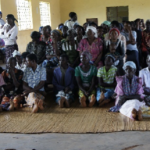 “Our visit today was to the Bufukhula Sismukha Women’s Group in Lubaale, supported by a local organisation called Sharing Opportunities Uganda. We were overwhelmed by their welcome – lots of singing, dancing, celebration and welcome speeches – but what they are doing and achieving here is inspiring and encouraging. Talking with a small group of them, I heard testimonies from people who had come from nothing… with no hope and self-respect, and gained both, as well as economic stability, through membership of their group. The group is a support group and they are all friends and they all save small amounts of money each week together. From those savings they can borrow to enable them to start small businesses and also to pay school fees, cover emergencies like sickness and so on. Some said that during the recent drought they would have starved if they hadn’t been able to draw on the resources of the group. The organisation provides training in a wide range of things for them to help ensure that they succeed – but primarily its aim is to be the catalyst for their independence and sustainability. Although the context is so different, there were some parallels we could draw with what we are trying to achieve in Wales and some encouragements for our biggest problem in growing the movement in Wales which is how to reach the most depressed and isolated people, who would gain the most from our groups.”, with no hope and self-respect, and gained both, as well as economic stability, through membership of their group. The group is a support group and they are all friends and they all save small amounts of money each week together. From those savings they can borrow to enable them to start small businesses and also to pay school fees etc and to cover emergencies like sickness. Some said that during the recent drought they would have starved if they hadn’t been able to draw on the resources of the group. The NGO provides training in a wide range of things for them to help ensure that they succeed – but primarily its aim is to be the catalyst for their independence and sustainability. Although the context is so different, there were some parallels we could draw with what we are trying to achieve in Wales and some encouragements for our biggest problem in growing the movement in Wales which (apart from the benefits system!) is how to reach the most depressed and isolated people, who would gain the most from our groups. with no hope and self-respect, and gained both, as well as economic stability, through membership of their group. The group is a support group and they are all friends and they all save small amounts of money each week together. From those savings they can borrow to enable them to start small businesses and also to pay school fees etc and to cover emergencies like sickness. Some said that during the recent drought they would have starved if they hadn’t been able to draw on the resources of the group. The NGO provides training in a wide range of things for them to help ensure that they succeed – but primarily its aim is to be the catalyst for their independence and sustainability. Although the context is so different, there were some parallels we could draw with what we are trying to achieve in Wales and some encouragements for our biggest problem in growing the movement in Wales which (apart from the benefits system!) is how to reach the most depressed and isolated people, who would gain the most from our groups. with no hope and self-respect, and gained both, as well as economic stability, through membership of their group. The group is a support group and they are all friends and they all save small amounts of money each week together. From those savings they can borrow to enable them to start small businesses and also to pay school fees etc and to cover emergencies like sickness. Some said that during the recent drought they would have starved if they hadn’t been able to draw on the resources of the group. The NGO provides training in a wide range of things for them to help ensure that they succeed – but primarily its aim is to be the catalyst for their independence and sustainability. Although the context is so different, there were some parallels we could draw with what we are trying to achieve in Wales and some encouragements for our biggest problem in growing the movement in Wales which (apart from the benefits system!) is how to reach the most depressed and isolated people, who would gain the most from our groups. “Today we went to three rural communities with another partner organisation called BRDC and between us met and talked with 6 different self-reliant groups. They are all organized in a similar way to ours, meeting weekly, saving together and supporting each other, creating an environment which allows them to move towards reaching their potential. 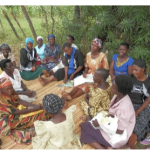 “We spent some time today with a self-help group in Mwanda – another rural one. We heard some fantastic testimonials and I thought I would write about just a couple of them. Lorna was a roadside seamstress, repairing clothes with a small treddle machine for passers by. She was invited to join the group and found friendship and support there and started saving small amounts. From this she was able to buy more materials and instead of working on the roadside she started to win contracts with schools to make school uniforms. She also gained a goat through the group and the two things have improved her income significantly. She now has plans to get a second machine, train local girls and any group member who is interested and then take on bigger contracts which will employ them all! She also makes her own range of clothes and asked if we could sell it for her in the UK. Rebecca had a goat through the group, bred it successfully and is aiming to trade in her kids for a cow – and in the longer term she wants to buy a motorbike so that her husband can earn as a bodaboda rider (like a taxi on a motorbike). She said she was very poor and unconfident and it is the group, especially the elderly women who gave good advice, who have helped her blossom. contracts with schools to make school uniforms. She also gained a goat kid through the group and the two things have improved her income significantly. She now has plans to get a second machine, train local girls and any group member who is interested and then take on bigger contracts which will employ them all! She also makes her own range of clothes and asked if we could sell it for her in the UK – I’m going to investigate! Rebecca had a goat through the group, bred it successfully and is aiming to trade in her kids for a cow – and in the longer term wants to buy a motorbike so that her husband can earn as a bodaboda rider (like a taxi on a motorbike). She said she was very poor and unconfident and it is the group, especially the elderly women who gave good advice, who have helped her blossom. Great proof of the effectiveness of the groups, transforming the lives of individuals and bringing out the entrepreneur in them!contracts with schools to make school uniforms. She also gained a goat kid through the group and the two things have improved her income significantly. She now has plans to get a second machine, train local girls and any group member who is interested and then take on bigger contracts which will employ them all! She also makes her own range of clothes and asked if we could sell it for her in the UK – I’m going to investigate! Rebecca had a goat through the group, bred it successfully and is aiming to trade in her kids for a cow – and in the longer term wants to buy a motorbike so that her husband can earn as a bodaboda rider (like a taxi on a motorbike). She said she was very poor and unconfident and it is the group, especially the elderly women who gave good advice, who have helped her blossom. Great proof of the effectiveness of the groups, transforming the lives of individuals and bringing out the entrepreneur in them!contracts with schools to make school uniforms. She also gained a goat kid through the group and the two things have improved her income significantly. She now has plans to get a second machine, train local girls and any group member who is interested and then take on bigger contracts which will employ them all! She also makes her own range of clothes and asked if we could sell it for her in the UK – I’m going to investigate! 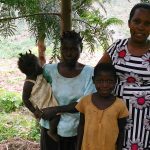 Rebecca had a goat through the group, bred it successfully and is aiming to trade in her kids for a cow – and in the longer term wants to buy a motorbike so that her husband can earn as a bodaboda rider (like a taxi on a motorbike). She said she was very poor and unconfident and it is the group, especially the elderly women who gave good advice, who have helped her blossom. Great proof of the effectiveness of the groups, transforming the lives of individuals and bringing out the entrepreneur in them! Our last full day in Uganda was spent with another partner of the Mbale Coalition Against Poverty – Ugandan Women’s Concern Ministries. This organisation, originally aiming to help children, realized early on that the most effective way to support children and communities was to support women to earn their own income – this would help not just the women but their entire family. We visited the community of Nabumali and after another overwhelmingly warm welcome of songs, drama and poetry, each of us spent some time in the groups hearing from the members about their impacts: a widow who is caring for 8 of her own children and 4 orphans and not only receives help from the group financially when she is struggling, but has also gained self-respect because she is able also to contribute to the group. Another lady who was trying to make do as a streetseller of a local pancake-like delicacy (delicious – she gave me one) was enabled to turn that into a proper business through the encouragement of the group and the savings which she accumulated through being part of it. Their best quote (apart from “we are kicking poverty out of Nabumali) was – “we begin with the little we have and go on to build”. Not a bad motto for our self-reliant groups in Wales too!